I’m writing to you feeling almost refreshed after coming back from Costa Rica, and ready to take back the reins of my life, even though they’ve never really been in my hands (I don’t think). I didn’t do much in Costa Rica. I needed some time to relax and reflect. It’s really interesting to totally change the way you work for a whole year, which is what I did to make room for writing my book. You develop a kind of never-ending FOMO, but it also helps you to get some perspective. A blog is an enormous amount of work (I’m not complaining, I love it!!!) and it never stops. In nine years (yes, the blog will be 9 years old in July!!!) (I can’t even tell you how big of a party we’ll throw for the 10-year anniversary next year, we’re already starting to plan for it), I’ve rarely had the time to stop and wonder about the how and why of it, or to see what was going on around me in my “world” without being totally subjective. This change in perspective happened right when our habits with the internet were changing completely. Mine just like everyone else’s. I almost never open my computer anymore, except for work. All of the fun things have moved to my iPhone and iPad, where I use apps to download my favorite content. And I spend way too many hours on Instagram and social media, of course (my recent infatuation with Snapchat really isn’t helping me ever take my eyes away from my phone) and I have less and less time to spend looking around and “surfing” online. Surfing the web is pretty much over. I also asked myself what I personally wanted to see online, and of course, on Garance Doré. A website isn’t a single destination these days — it’s more like a constellation that includes all the social media and any activity we get involved in. The site itself is still the core (although some people might say Instagram is really the center now) but everything happening outside of the site is as lively and important. Our site has changed a lot this year to make room for writing my book, and honestly, it was time. Doing so much myself was becoming impossible, and plus, I really love working with a team. I remember that when these changes started happening, I talked about it a lot with Scott (who is still a great friend and someone whose work I deeply respect) and we had totally different points of view – he likes to work alone, traveling the world, taking photos, and staying as free as possible, while I really like to collaborate and work on ideas with a team. So today, the blog isn’t just me. It’s also Erik’s photos, and Sandra’s photos, and photos from other collaborators, and it’s Brie’s, Neada’s, and Emily’s voice and ideas. Like I said in my last letter, I’m finally 100% back so I’ll be much more present on the blog now – but we will continue to value our work as a team. The site will keep evolving, but maybe not in the way you’d expect. Because my answer to the question “what do I want to see online today?” is definitely not more more more content for more more more followers and more more more noise. It’s the opposite – I want posts that are special, better. I want it to be more intimate and more authentic. I’ve always wanted my site (and now, our constellation) to be like a warm, welcoming house where you can come to spend time and leave inspired. You might be surprised sometimes (like with our choice to post the monthly horoscope – but we read our horoscopes and love the advice and reading suggestions that Ophi and Ephira post. So why not?) (or my choice to cover fashion week less – what is there left to say when fashion week already gets way too much coverage and we know what’s going to be on the runway before the show even begins?) but everything we do always comes from a place of enthusiasm – trying to do things in a new way, and loving sharing things with you. And it seems even more necessary now than ever. p.s. See the photo? I found my Gucci jeans!!! More on this on Tuesday’s post. Big kiss! Your blog is the first website, I visit every single day! I love the way it evolves and your team work is so good and wonderful. Your Gucci jeans together with the Valentino pumps are perfection! Je continuerai toujours à suivre ton blog Garance, pour son authenticité, et sa bonne humeur. Continue dans cette voie ! Ca fait du bien de te lire si simplement. Je traverse aussi une période comme toi envie de changement de simplicité de partage de moins pour plus. C’est exactement ce que j’ai envie de créer! I really agree with you, that what I love is the Garance-ness. I am glad to know that posts will be limited, because I appreciated the posts much more when they were one a day- and not even always! Sometimes weekends were just off, and that was cool. I too feel this way. I discovered your blog when you were still writing in French and I was still living in Montreal. Of course it has to grow and change, it’s an organic thing, but I do miss your voice and tone Garance. Also, we are in the same age group and I really love connecting with the content on point. I don’t always feel the same way with the other contributors because the outlook and taste I am looking for just isn’t there (yet). That being said, you have keen digital sense and instinct, so I trust you in that way Garance. I still visit the blog everyday, but I don’t read everything like I used to and I don’t get that same rush of anticipation to see what you will post like I used to. Looking forward to see what you are going to do next! In complete agreement here – delighted to hear that there will be changes. I’ve come to the page to read what Garance Dore has to say, what’s going on in her life, her perspective on issues or questions, what the people she interviews have to offer. When I visit I give the page a perfunctory glance, typically reading only the DelVal list – they always have something interesting to offer. The Studio team may all be lovely and talented people, but – they have nothing to say that interests me. For example – I really don’t care what someone else carries in her bag. Dear Garance, you are an amazing woman and so talented. You do great work and you’ve really come into your own! I hope you don’t mind all of our comments, most of which I agree with, but the most important thing, for me at least, is that you continue to be a voice for those of us older girls. There’s so much content online for 20-somethings, but I’ve always identified more with you because we’re the same age and going through the same stylistic changes and tastes (as well as moments in life, perhaps). This isn’t to disparage your younger contributors, but their viewpoint is quite different than what I’ve come to expect from your blog. What I’ve always enjoyed so much about your blog, apart from your beautiful aesthetic, is that you’ve been so candid about your life which includes turning 40 and how every day is still exciting, fun, and youthful. Yay, 1975! I admire how you keep sharing your thoughts so we’re all on board while you evolve and boy have you evolved! I still look at the Garance Doré’s constellation with a lot of pleasure and excitement even after 9 years. 9 years ago I moved from Paris to NYC so that’s been quite a journey for me as well and I also launched my agency (I have to say I dared doing it a little thanks to you). Read you soon and hopefully see you and your team soon again! Garance, you’re warmth and vitality are what makes me return to your website and IG . I love the Pardon My French segments. So feminine and empowering. Keep on! There’s always so much to talk about.???? We hope to make more PMF very soon! I know I’ve said that for a while but it is true – it’s one of our top priorities. Garance, your warmth and vitality are what makes me return to your website and IG . Keep on! There’s always so much to talk about.???? Keep your voice in your work, it’s what makes me keep coming back! Like you said, I want to see content that is more authentic and personal. When blogging first became popular, people wanted a blog they could escape into. But now we live in a world full of escapism. I feel like everyone is trying to portray this perfectly curated life. I really wish that I could find a blog I could relate to as a young woman. A place that had all the style and beauty content I loved but still addressed the serious issues we all face in our lives. As for this blog, I still love it. Maybe not as much as I once did, but I understand things change. I do wish that it had more you and was less magazine like, but a blog is something that constantly evolves. It’s ok to change, not everyone will like those changes and not everyone will continue to follow you but I think as long as you remain true to yourself you are always going to have a core group of people that will follow you. I’m looking forward to seeing the changes you bring about in the next couple of years. D’où viennent ces magnifiques chaussures :-)?? Alors là il faut s’attendre à de gros changements !!!!! Je le sens…. J’adore les changements et je suis d’accord avec toi, la fashion week ça devient overwelming on lis la même chose partout et c’est too much. Less is more, plus de contenus profonds et persos – c’est ça qui fait vendre!!!! Mais toujours ta légèreté et ton auto dérision qui te caractérise! Peut être plus de photos??? J’adore les photos et les tiennes sont toujours super chiadées. J’adore ton blog, simple, frais, visuel, charmant, élégant, et toujours une idée nouvelle! Les changements? Je les attends! En avant! J’aime beaucoup tes réflexions autour de ton travail (et maintenant vos réflexions) (et surtout que tu prennes le temps de parler de tout ça à tes lecteurs) et je pense que quels que soient les changements à venir le plus important c’est que le contenu reste authentique. Je suis ce blog depuis de nombreuses annees et ne m’en lasse pas car les articles passent des plus emouvants aux plus droles, des plus frivoles aux plus serieux, bref, j’adore ! Les chaussures de la photo sont magnifiques ! I am so happy I found your blog and have been very inspired by it. I cannot even imagine your work load or what you and your team put in to eah and every post! Thank you for all this and the ever changing expanding that you go through to find growth. Every choice is not always clear and simple but I give you tons of credit for putting so much into it all. Je n’aurai que plus envie encore de venir sur le blog avec ces changements! Je te suis et j’adore, j’adhère à tout ton blog Garance! Keep going! Bring more of Pardon My French! Quel plaisir de te lire!!!!! Je suis également impatiente de lire ton livre! Ton blog m’inspire. Concernant son évolution, j’y trouve énormément de plaisir! En littérature, je suis passionnée par l’épistolaire, alors un blog à plusieurs voix ne peut que me plaire! Je commence à m’attacher à certain(e)s de tes collaborateurs (Briiiiiiiiiiieeeee). Je dois te suivre depuis 7 ans maintenant, et je réalise que ton blog me donne des envies. Te voir tester des choses, prendre de risques, bousculer ton quotidien m’inspirent. Du haut de mes 23 ans, je me prends à rêver à vivre à NY et à sérieusement considérer postuler à un LLM à NYU (alors qu’il y a encore peu braver ma peur inimaginable de l’avion pour quitter mon amoureux/mon studio/mon chien/ma famille/ma ville était impossible), prendre des risques concernant mon style, gagner en confiance. Avec le recul, il n’y a que ton blog qui suscite ce sentiment. On partage tellement de choses avec toi/ vous. Rien ne peut me faire plus plaisir!!! Vraiment! C’est parfaitemet possible que je ne suis pas suffisamment attentive, mais j’ai l’impression de ne pas avoir compris ce qu’il y aura de nouveau sur le blog ( à part que ça va être moins bruyant, moins hectique à suivre les trends ). Vous allez nous en parler? Tu as raison de faire des changements, à chaque étape, le dessin puis les photos, puis les films, puis les mini post ça devenait plus riche , diversifié, vif. Toujours très Garance. C’est devenu trop business à mon goût. trop de produits, présentés. ça fait un peu lien promotionnel certains jours. Et tout agréables que soient les post de tes collaboratrices, ils n’en demeurent pas moins gentillets. sans grande originalité. Si je viens c’est pour lire les aventures de Garance, pas celle de Neada, d’Emily ou des autres qui ne me font pas vraiment rêver. C’est ta team, elle est sympa mais ils n’ont ni ta drôlerie, ni ton allure. Alors à vrai dire, je viens de moins en moins. Et je ne lis que les posts signés par toi. qui possèdent toujours cette pétillante généreuse et unique.Ah et puis est-ce politiquement correct d’avouer que je regarde les photos de ton nouvel amoureux que je trouve simplement canon. Vous formez un couple très hollywoodien.En bref: plus de Garance please. E si ta team travaille que ce soit au moins pour que tu puisses passer plus de temps avec le beau Chris:) et qu’on ai plein de photos de vous et de vos futurs bébés. Ahahah trop mignon. Merci pour Chris <3 – j’entends complétement ce que tu dis en tout cas, message reçu !!! C’est exactement ce que je pense! La team GD est adorable mais leurs articles sont très convenus. Ce que je préfère et la raison pour laquelle je viens, c’est toi et ta plume! Vivement ton retour! I can’t wait to see the changes. I love how you are embracing the need to change. We all have to. “I want posts that are special, better. I want it to be more intimate and more authentic.” Yes!!! I love the way you’re evolving — you honestly have one of the best evolving blogs. Your blog really inspires me — I love when you interview women on their style. Reading the blog Is always a cozy, intimate yet a step ( or more) removed from my reality- experience! Keep up the good company! And tell us more abot these shoes! Hi! I love your job and your blog. I read your blog every day. I think that we all deserve a break when we work hard. But when there is a job that needs inspiration, even more. You works hard, your blog is amazing, therefore you deserve a vacation and relax. When you come back you will see everything is from another perspective. Dear Garance – I love your openness, fresh candor and eyes on things. I too miss your blog when it was all from you. Though you have always and generously shared your interests, friends, their thoughts and ideas in discussions… with us, framing it through your distinct voice and personality is unbeatable. It is always met with delight when I see a post from you. :) There is the occasional and slight disconnect at times when I come across an article in a tone or attitude that I don’t identify as yours. Perhaps it’s because I do not know your team’s personas. However, you are indeed one person and you said it right – it’s about having fun in your work and surrounding yourself with the right people that can make it so. We love your blog and your team but know that we love you the mostest. :) All the best. Garance, as someone who once wrote for print publications — and was actually well paid for that work — I have long admired how you have pushed the boundaries of the online form and are, in fact, breaking new ground along the way. I do especially enjoy your posts and I think your work is what keeps me coming back for more. Thank you for today’s post and photo. It reminds me that although I recently celebrated my 60th birthday, my feet and ankles are still in great shape (as is the rest of me, actually) and for that I am truly grateful. Thank you and keep on being grateful ! Moi j’aime que tu postes l’horoscope du mois! J’ai hâte de voir ton jean un peu plus et les chaussures qui vont avec sont magnifiques! I really enjoyed Pardon My French and This Is Trending! and I am still waiting for you to post a little video about the new makeup routine that your makeup artist did for you. But i will never visit your site for the purpose of reading a horoscope. You have a very unique enchanting way of expressing yourself Garance – so as long as you carry on in the same way combining it with your totally gorgeous illustrations and stunning photography then in my opinion that’s the main thing! I love how your blog is evolving. 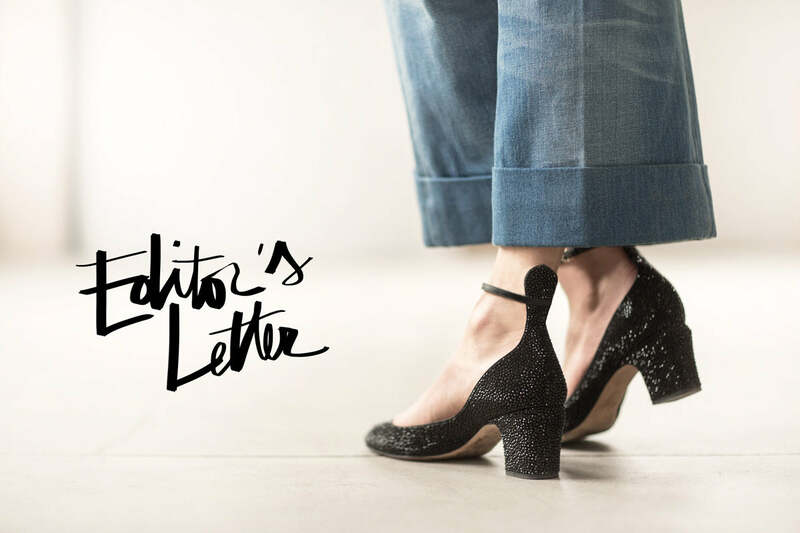 It’s something new but I really look forward to your editor’s letters because they remind me of that first more personal Garance Dore. They made me feel we are in touch with you :) I love that your blog doesn’t feel like your personal window to display your awesomeness, like most blogs are nowadays. I loved Pardon my French and I miss it. Um… what else? I LOVE the posts more dedicated to photography, like the ones you did about the New York ballet. I would love to see more posts like that. All in all I feel that your blog is a place to be calm, not a site where you scroll down quickly and leave. It’s quite relaxing and inspiring! Keep following your instincts Garance, they are always so on point!! what has always set your site apart from the others is that there is substance to it, it comes through even when talking about nail polish:) and it’s always authentic and welcoming. I come daily to your site (that is not something I do even for my Facebook or other social media sites). Your site has always been for me about this direction that you are emphasizing now, it was never really about the fashion (though I enjoyed the inside view you brought to us), so I’m excited they will be even more of that; it’s really cool to discover new things through your experiences and the access you have to things I don’t have access to. I also enjoy the new voices in your team they compliment yours so well it’s almost seamless. Keep on the good work!! I’ve been following your blog for the past 9 years (I’m almost 24 now) and it really helped me grow. Thank you for all of that Garance. You probably heard this a million times, but one more time can’t hurt – you really are a special person, and this is a really special platform (because website doesn’t quite covet it enough I think). PS. Excited to see your Gucci jeans! But what about those shoes? Are we going to get more familiar with those as well? Je me dis parfois que ton blog est devenu un yaourt O% un peu fadasse .Cà manque de personnalité. J’aimerais que celles qui écrivent dans ton équipe aient plus de style dans l’écriture et d’originalité ds les sujets. Il y a parfois un côté”clone” exaspérant. ils sont trop sages et bons élèves. La constellation comme tu l’appelles est une super idée . Et comme tu vas faire une tournée pour ton livre, one more time tu ne seras plus là !!! trouve une cancre géniale ! I have visited your blog regularly from the beginning because of your consistently beautiful and unique photos and styling (my faves are fashion and interiors), the real/everyday yet special feel of your subjects and your good taste. I read your perspective on fashion trends, good places to visit and what stylish people are wearing and doing in their real lives. I don’t tend to read your other posts, not because they are lacking, but I’m more interested in seeing and reading your perspective and stories on trends. Your blog is sort of an authority for me on what’s beautiful and refined yet real in NY from a French perspective. I don’t know many other blogs and certainly not print (most editorial is too detached from real life) that I trust to be this consistent authority on the visual and cool- this, for me, is what makes your blog great. Instagram provides some visual perspective on this but the photos and styling aren’t very good and you have to see a lot of blah stuff before there is something somewhat visually interesting (and the broader point of Instagram is the social aspect anyway). I haven’t noticed a change in the quality of your blog. I look at everything on my phone or iPad, too, so keeping it beautiful in this format is important. I don’t find the horizontal reference to recently old posts visually compelling- I think it would be better to have fewer posts and show them in vertical format like before. I know others are drawn to the social aspect of your blog, your life and personality- this is understandable- your sincerity, warmth and voice are great. I’m more interested in the photos and you and your team’s perspective on real life trends as well as interviews with stylish women about fashion and their personal style (not as much beauty, but that’s just me). I’m sure there will be a variety of different reasons people visit your blog- I hope you get lots of comments! Staz, very interesting comment and very interesting (and different) point of view. Thank you for that! In reading the other posts, I agree that your point of view and unique voice is what is really especial and is at the bottom of it all. But I think you can still manage to keep the personal side by sharing your stories and reflections (I loved your pieces on your personal journey and nyc vs paris, etc) while also curating the work of your team so that it fits and meets the Garanceness “sauce” that we all love. As I said in my previous comment, I think you have selected a team that are individuals but also authentic like you and I think they “fit” as your employees. Maybe the disconnect for other users came from the number of personal posts from you that was dramatically low in comparison to before, and not so much the inclusion of the unique voices of your team. I think if you adjust the weight of personal posts vs. contributors posts than it will start to feel once more as a personal blog. For me, I think it might have been a good trade off, yes there was less of you in the blog for a year, but we your audience get to have a whole book with just your voice and reflections to binge on in the near future:)) I don’t think you can get much more deeper than a memoir [at least I’m assuming it will be a sort of hybrid memoir, self-help (reach for your dreams being open to new experiences), with lots of cool illustration type of book]; any way, can’t wait to see what it will look like! Dear Jessica, you got it right about the book ! And thank you, what you’re talking about is the direction I want to take – so I’m reading these comments with so much attention….! Je dis oui oui oui au retour du blog plus “intime”! A chaque fois que je vois un de tes posts, je frétille d’impatience, car je sais qu’il va me plaire ou m’inspirer. J’aime aussi ceux de ton équipe, sauf quand il s’agit de posts un peu trop “superficiels” (moi la manucure, ou comment faire pour que son fond de teint ne soit pas dégoulinant en fin de journée, ça m’intéresse moyen), mais il en faut pour tout le monde. Par contre une chose que je n’aime pas du tout ici, c’est l’évolution business-magazine en ligne avec des liens et images “pubs” en veux tu en voilà,… Ca surcharge un peu trop le ciboulot, et ça pique les yeux! J’ai hâte de découvrir ton livre, ta nouvelle ligne éditoriale, et tes pérégrinations futures. Merci pour tout ce partage en tous cas! Flore – Merci ! Quant aux liens et aux pubs – la seule chose que je peux dire c’est que tout est choisi par nous, et que pour nous c’est un service qu’on rend (bien sûr on prend une petite com dessus) et que les opérations commerciales sont toujours clairement mentionnées. On n’en fait pas beaucoup, en fait! Merci pour ton honnêteté. Je vais l’être à mon tour. Je viens sur ton blog depuis de longues années, bien avant que tu ne déménages à NY. J’aimais ton style d’écriture, tes photos, tes histoires folles,… Et puis la vidéo est arrivée et la encore, tu as frappé dans le mille. Encore une nouvelle facette que l’on découvrait, nous, tes lecteurs. Alors c’est vrai que depuis qques temps, je ne viens plus aussi régulièrement qu’avant et je me surprends à zappé les posts qui ne sont pas signé de ton nom. Comme j’ai pu le lire dans qques commentaires d’autres lectrices, je ne me retrouvais plus dans ce nouveau style “pluriel”. Pcq je viens ici pour les émotions que toi seule pouvais me procurer et même si ton équipe à l’air vraiment sympa, ce n’est pas toi.. Tu m’as manqué Garance. J’espère que l’évolution du blog sera une réussite, aussi bien pour toi que pour nous. En attendant je te/vous souhaite bon courage pour le travail qui t’/vous attend et surtout, surtout, des idées folles à n’en plus finir. Je vais m’organiser pour les faire revenir bientôt !!!! I am sure that anything coming from you will be great. Long live to GD blog! whouuhouuuu garance bientôt de retour :-D super j’ai hâte de découvrir les changements, de voir le live!!! Continue comme ça, lire le blog fait toujours super plaisir! Merci de l’avoir fait, il apporte chaque jour un peu de bonheur ett je le lis depuis bien longtemps maintenant!! I love the way the site and your interaction with all of us has opened up in the past year. Great work as always. Love the shoes. Unfortunately sold out in Europe, at least.. I couldn’t find them anymore :( any tips? I visit your blog every morning with my coffee. Your voice is feminine and empowered, never apologetic, but always generous and a step outside of the “norm”. i love it and i listen to it. Though i am quite a bit older than you and your team, most of the posts I can still find relevance. i do wish the “older woman”, I am in my fifties, could get more attention. maybe thats just how I feel in my own life. We do become a bit invisible and ignored.I have not yet found a voice on line that was on the level of sophistication as yours but addresses the woman past 45. Dear, start your own blog, then it will exist for everyone who feels like you do! Totally! And if you hold tight, one day soonish I’ll be over 45 (and proud of it ;) !!! Yes, I agree with a lot of the comments. I have been reading your blog since you were were writing in French. I loved your voice and humor about everything that we “women” go through. It was the voice of an older sister I wish I had. I still read your blog but I do not do it everyday and I do feel that the other voices are not as salient to me as yours, it does not feel as one to one as it did before. I feel like while your staff is great, they are very much like the other voices on other blogs, which makes it less special than it was before. This is my first comment on your blog, although I am reading it nearly every day since 8 years. Thank you for inspiring me. My working attire ( i work in a viennese art gallery) has changed completely! Thanks for all the positive moments and fun I had. Alors… Je comprends ton envie et trouve extra la place que tu fais à ton équipe ainsi que leur enthousiasme. Après, autant côté photo, Erik et Sandra me régalent, autant côté textes, je guette tes interventions car les filles sont un peu jeunes et même si leurs propos m’intéressent, elles n’ont pas la “plume” que j’aime lire ici et me donnent souvent l’impression d’être sur un forum pour ados (désolée!!!!!). Concernant la fashion week. Je suis restée un peu sur ma faim car oui, elle est surcouverte mais moi la seule couverture que j’aime (ou presque), c’est la tienne, pour la raison citée juste avant, ta plume, ton point de vue unique, ta mise en perspective des choses. Bref, tu m’as manqué :D Je suis ravie de lire que tu seras là davantage (smiley qui rougit). I miss your old blog and your voice. I rarely read your blog now. The transition from the Garance Dore blog to Garance Dore brand brings some interesting challenges around trust which is ultimately the pillar of any media success. As a business, you review the analytics. I wonder if you are getting good adoption of the new team-contributed content. I personally tend to only click on pieces signed by you perhaps because I read in French and I look for an authentic French voice which I cannot consistently find with the other contributors. I struggle mostly with my feelings about the increasing role of native advertising which is different from brand collaboration and again is about trust. Très intéressant Garance …vraiment intéressant. Depuis le temps que je te lis (damn …7 ans!!! ), je n’ai jamais laissé tombé GaranceDoré.com, même quand je ne comprenais pas trop où tu allais et/ou plutôt, où allait le site,même quand certains posts me laissaient perplexe … je suivais le mouvement car je suis curieuse et j’aime tes prises de risques. Le changement en règle générale, est souvent désagréable mais réserve souvent de belles surprises au final, et c’est ce que j’ai toujours ressenti et vécu avec ton site. Ta nouvelle ligne directrice me plait beaucoup, et dans 7 ans je serai certainement encore là! ;p …Merci à la team et aux collaborateurs pour ces posts inspirants et beaux. Hey Garance!!! I’ve been reading your blog for years and I partly agree with some of the comments above, the Garance-ness is a bit lost, but I can still tell it’s you. I personally would like to see more of your personal style, since you inspired me to fall in love again with chemises!! lol And PMF would be good to see again. I am glad that your blog is expanding and allowing different perspectives to be shared. I do get confused at times about certain titles: “contributor” and “collaborate” I used to think one meant sponsored post. I know you mentioned before that you would underline where a post comes from brand sponsorship. But I haven’t seen this or do not know what the indicator is, so for the most part, I have assumed all products shown on your page from beauty discussions to clothes are all sent in by brands / brand sponsored. Could you please be more specific or clear as to which is which. first la mode: love the hole gucci collection since I saw it in a promo video with Lykke Li. your blog: it’s really an everyday-ritual to look what’s going on here on your blog (like a daily chat with a good friend). The thing I love most, is to see you always as an early bird … streetstyle photographer…social media channeling … responsive webdesign … To keep on wheeling and going forward, to find time evaluating new things*, there was no way than to build a team- and you did it in a great way! Hold on, I’m really looking forward what is coming around the corner. Happy Easter – Feast of the raising! I want those shoes … and your lovely ankles. Je me retrouve dans plusieurs commentaires que j’ai lu plus haut. Ça fait plusieurs années que je suis le site Garance Doré et j’adore ! Bien sur certaines évolutions me plaisent plus que d’autres mais c’est le seul site que je lis tous les jours et sur lequel je prends autant de plaisir à lire assidûment. Ce que j’aime par dessus tout c’est lire tes posts perso, ils sont uniques, drôles. Plein de belles choses à toi et ta team ! Je seconde! Tes idées, tes mots, ta voix c’est ce qui me donne envie d’y retourner à tous les matins! This is the only blog I really visit every day, I love all your posts and everything you have to say. I miss Alex, might be good for the team to follow that type of content, more beauty with personal take. I really don’t like when you advertise brands here, I know there’s not much but still. Garance, your blog was once such a fresh breath of air, something I savored along with my morning coffee, daily. It was chic and it was dreamy and your personality shone through like sunshine! Change is inevitable, but the website is a bit of a hodgepodge now, the content is less exciting and the design itself lacks cohesion. What once felt like a more alternative and new take on fashion and life style, has become common and unexciting. The commercial aspect is a turn-off. This isn’t entirely your fault, fashion blogs and fashion week over-exposure have much to do with the lack of content. I wish you and your team success and I hope I can fall in love with you again in the future! I’m looking forward to seeing what’s next. I really liked the Pardon my French videos, and would be happy to see more of those? i think you have done such a great job of keeping current and interesting, you are the first blog i visit every morning and alway my fave!! also can’t wait for your book, what an accomplishment!! Garance, with kindness I have to say I agree with many of the comments about the blog and, in particular, those from Sonia. I, too, loved its previous iteration – its chic and dreamy quality, and the lack of commercialism with only the very occasional product placement. You personally have such a unique spirit and voice. Looking forward to seeing what change are in the wings! Hello Garance and Team, I am reading your blog for several years now and it never stops inspiring me. Team work is great in general and it definitely works for you too, in my opinion. The reason for this I believe is that you have a clear vision and high standards. So for me the blog still feels personal and unique. One thing I truly miss is your Pardon my French series. Or other video content you were doing before. For example, because of you I have discovered Amanda de Cadenet and her The Conversation and I am a big fan ever since. However, there are new things that I always check out like The Del Val, which is always interesting and leading to discoveries. Other things that you have started doing since like weekend inspiration – super nice, and city guides and career guides. I noticed you become big as an online shop, I am not very interested, but as long as the blog stays with its posts, inspiration, fashion, style stories, that’s all good. So to sum up, you are great, you and your team, I love your blog. It has to change, change is always good (not always an instant love, but it comes) and so far you were doing it great, and I wish you all the best and I hope you will keep us inspired in the future. Also, looking forward for your book! Thank you! Personnellement, je suis encore beaucoup les blogs, au moins autant qu’Instagram. Le contenu y est forcément plus profond, plus intéressant, et je trouve les deux bien complémentaires. Je vais sur le tien presque tous les jours, parce que j’aime tes textes, tes photos, ton point de vue sur la mode, et du coup je trouve un peu dommage que ça devienne un site communautaire. Pour moi, un blog c’est avant tout une voix, et quand je viens ici c’est pour t’entendre toi. Pour être honnête, je commence par regarder l’auteur de l’article avant de l’ouvrir. Enfin, quelle que soit la forme je continuerai à venir ! Et j’ai hâte de voir à quoi ressemblera ton livre ! Après avoir lu plusieurs commentaires je réalise que plusieurs sont, comme moi, laissé de glace par les posts des membres de l’équipe. On semble vouloir plus de Garance-ness et c’est dur parce que réalistement, vous avez besoin d’être beaucoup pour tenir ce blog. Bref, j’y réfléchissais et je me disais, qu’en fait, non seulement on aurait besoin de plus de post de toi (évidemment), mais également, je crois qu’on a besoin d’en savoir un peu plus sur tes collaborateurs. Leur voix est difficile à apprécier, car on n’en comprend pas encore les subtilités. (Par exemple, je crois que souvent leur humour est beaucoup plus direct et expliqué, raconté, que celui de Garance, car comme on ne les “connais” pas il importe d’être clair. L’ironie est donc nettement moins appréciable.) Je crois que si vous voulez qu’on apprécie plus leur post, faudrait peut-être qu’on comprenne un peu plus qui ils sont, d’où ils viennent, ils vivent quoi, etc. Garance s’ouvre beaucoup et on en vient à ressentir son humanité et sa vulnérabilité, mais ce n’est pas nécessairement le cas de tes associés (bon pas besoin de tout nous raconter votre vie privé, elle vous appartient, mais y’a moyen de s’ouvrir un peu je crois…). C’est super intéressant et riche d’avoir une pluralité de voix et d’esprits qui nourrissent le blog, mais peut-être qu’on aurait besoin de sentir cette humanité (qui rend le blog si attachant) dans leurs posts à eux aussi! This blog was the first that got me into reading blogs, and now writing one too! I love the honesty, personality, and fun flair that is http://www.garancedore. It’s still one of my favorite daily stops and I look forward to each style exposé, inspiring career interview, and ever-amusing anecdote. Thank you, Garance, and your team for the amazing amount of dedication and time you all put into making this site a professional and yet personal place to visit. I so admire how you seek to connect with readers and still remain true to yourself and your goals. Looking forward to more good things to come in year ten! You are the spirit of the blog. Your personality is its essence. Your other contributors seem lovely but do not have the charisma you do. Their posts do not have the charm, humour, brightness of writing style or insights that I respond to in yours. It is your opinions that matter to me and your style, commentary, “Frenchness” and flare are what brought me here to your “home”. I have truly felt your absence, and while I appreciate that you can’t grow and continue to do it all, I have to say that, for me, the blogs that maintain a single voice are the ones that appeal to me the most. But good luck with your continued growth. And please add a contributor or two who speak to women of a certain age! I totally understand your blog is expanding and you need a team to work on it. I don’t mind reading other members posts as long as they are original, interesting and inspiring. But I must admit posts from other members of your team are not as interesting, inspiring to me as those from you. It’s not because I am biased, I just find their posts lack of personality, a distinctive personal taste or perspective on style, the writing is often dry and lack of a connection to the readers. It feels like they try hard to do a good job posting something instead of try to intrigue, inspire and connect to their readers by themselves, their posts don’t make your blog much different from other blogs. Maybe your team can learn and improve with time and experience. I would like to see more interesting, intriguing, inspiring posts from the other members of your team, they don’t need to copy you as they do sometimes which is always not as good. Garance, you are part of my everyday life! Your blog is full of amazing contents, sophisticated ideas in a very personal way. Chic and simple all the same. Thank you! It’s totally understandable that changes are part of life and I am so glad that you are always evolving. Your team have been doing a nice job but it’s great that we will have more of you from now on. Keep going! I love it! We’re the same age so I relate to you a lot on many levels and continue to read because I feel the over-35 crowd is under-represented across digital media today. It’s nice to see your perspective on things. I agree with most people here, I come here to see your posts, so i think it’s actually great to have a team working for your blog as long as you are still a main writer. Please keep it so!!! As a lover of fashion, art, design, photography, and so much more, your website plus your other social networking accounts really have inspired me. One of the things that really drew me to your blog was your videos you made. I’ve always been fascinated with being able to see someone else’s life through videos and sort of following along with them through their day. Your Pardon My French videos I love, and I know there’s a lot of editing and stuff that goes along with those, but what if you also did something more “casual” like a daily vlog. To be able to see more of the small everyday things you do would be very cool. I can’t wait for what’s to come, and I will always be a fan of yours! So much criticism in the opening comments! I love the way your site has evolved, so much more than other sites that have attempted the same thing. Magazines – Vogue, Harpers, Elle – have diluted their brands with the need to post post POST! It’s confusing and seems to dilute their editorial voice. It dilutes their *taste*, their point of view, there very stylishness. I hate to call out another blog, but I feel very similarly about blogs that have tried to go editorial – like the Man Repeller. So much! So busy! And such gaudy, invasive advertising. So, now that I’ve bagged on other people, please let me heap on some praise. Sure it was cute to have it just be you, but this now feels like a well-edited, clean space. The number of posts doesn’t leave us wanting, but isn’t just regurgitation and fluff. It’s still personal, from multiple points of view – it’s occasionally amusing to be ~your ageish and see posts by folks so much younger – but it’s more, and I appreciate it. Also, I’ll honestly say it seems like there are more women of color on your blog since you got a staff. And that’s awesome. You must be very proud of all that you’ve accomplished with your blog these past 9 years! You’ve gone from a singular voice with a few followers, to a major brand with many admirers. You’ve provided a beautiful environment for us all to escape into. Change can be difficult. For those of us who have followed your career over the years, we have experienced many exciting changes with you. Honestly, now that your blog has grown into a small business enterprise, I appreciate that you have hired a group of individuals, who as a whole, provide creativity for almost everyone. There is far more representation for a variety of generations, compared to when it was just your voice. You certainly can’t make everyone happy, but I can tell, you are trying. Now that you have a bit more time for the blog, I would like more of your perspective on issues you are passionate about. However, you may want to avoid those two divisive pitfalls, politics and religion, even though we do have an election in our midst. I would love to see more photography. I love how you display a variety of photos. I hope you expand your shop – there are so many more products you could be producing! Pardon My French is so clever and Careers is inspiring. Your Stories are always so much fun! I enjoy the Fashion. Thank you for reaching out to us, your readers and Congratulations! Creating a community is no small feat. Super d’accord avec tous les commentaires. On veut plus de Garance attitude, ouverture d’esprit, decouverte, humour, amour et autodérision: des tranches de vie pas toujours glorieuses mais toujours tournees de facon hilarante, de l’esprit critique et impertinent français, de la bienveillance (hum, pas tres français ca…), et aussi un vrai regard sur tes pays d’adoption et d’origine, en tant qu’expatriee ca me fait toujours bien ricanner. Egalement why not un peu plus de culture hors fashion, mais seulement si c’est un peu elabore, avec un minimum d’analyse et de références, sinon c’est frustrant … et allez tant qu’on y est un ou deux ragots croustillants ça n’a jamais fait de mal à personne. Je te fais confiance sur la forme! I feel the expansion that you have made takes a real visionary with courage and generosity of spirit. You could easily have just stuck with your voice and pottered along very nicely, its a great voice and people resonate to your heartfelt and intimate expression. But Instead you chose to evolve beyond you, it has opened up the possibility for your team to expand along with you, those are the qualities of a true leader who leads with support and growth of the team rather than hold onto all the glory themselves. What you are doing Garance is making it about people first and foremost and the integrity of that connection you have with both your team and readers is what makes you stand out from not just the crowd, but the whole world. This is business model that could and should be applied to all levels and all industries, it is a true encompassing way forward for people to work together. Keep listening to your heart Garance and your expansion and expression will keep inspiring others in more ways than you could ever know. The world is continually evolving it is up to us to keep moving with it or not. I have to agree with so many of the other comments here – I used to visit your site everyday and read everything. Now I visit perhaps once a week and skim to see what interests me, and it’s usually only the articles written by yourself. You have a unique voice and I feel that for a blog to stay authentic and personal, it can’t really be a team effort. Don’t get me wrong, I know that to grow, you need to do different things and I love all your collaborations with Bonpoint, Equipment and Kate Spade etc, and I am excited about your book! But the blog needs to stay quintessentially YOU, and not become a curated magazine because there are just too many of those around. And like someone above said, it’s fine not having new content everyday, I’d be happy to wait for something amazing to read rather than a bunch of not-so-interesting gap fillers :) Growth is tricky – it’s a delicate balance finding growth and staying true to yourself. And also growing too fast can be dangerous. I hope you find the right balance for your blog! Mission remplie pour ton blog! Un epace d’inspiration sans prétention qui garde un côté abordable et chaleureux. Merci! Pleeeease please please pretty please MORE PARDON MY FRENCH vídeos!!! I (WE… I can’t be the only one here missing PMF) love your whitty and sweet attitude and it is super cool to actually see your written humour in real life!!! Hi! I’m writing from the other side of the world – Singapore. I loved the voice of your work from the beginning – inclusive, warm, and with a dash of self-deprecating humour. I guess the natural evolution of that would be to work in collaborations – I can’t wait to see what that means in your next steps. Also what I love is that before you came, the tone of fashion magazines were that fashion was taken seriously but the art of living so lightly but you did it the other way round which I totally love! As you explore the art of living (with style or without which comes necessarily) I hope you’ll share your explorations with us, the readers. I totally agree with your comments on blogging – I’ve been doing That’s Not My Age for seven years and have just published a book. It’s incredibly hard work but I love it and continue to do everything on my own, which is a stretch as I work part-time at university too. Like you, I need to make some changes, find an assistant and start to work more collaboratively. Thanks for posting this – oh and I would love to send you a copy of my book! Your blog used to inspire me everey, single day. So now I can only write one thing- congratulation! I can imagine that it’s so important moment! I trully admire your work! Le problème avec les autres contributeurs, c’est qu’ils sont justes des plumes, cela reste le site de Garance Doré. Du coup, comment s’attacher à eux puisqu’on n’a que des bribes superficielles d’eux (la beauté / la mode, point barre) ? Soit il faut que leur personnalité apparaisse beaucoup plus, soit c’est TON site et alors il faut qu’ils apportent surtout de l’info, mais de la très très bonne info. Pas en faisant du sous-Garance dans l’écriture. Comme beaucoup de commentateurs ici, j’aime ce blog, son élégance et oui, j’y reviens malgré des articles qui m’intéressent peu (la mode, la beauté – ce ne sont pas des sujets sur lesquels je veux lire, même s’ils me concernent directement). Par rapport à l’équipe, je trouve que plusieurs choses jouent : Brie, Naeda, etc. sont jeunes et font leurs “premiers pas” dans la mode/ le blogging. Et ça se ressent. Les questions qu’elles se posent (dois-je acheter ce t-shirt à 150 dollars fabriqué en Chine?) relèvent d’une éthique et d’une maturité qui me semblent un peu dépassées. Sans doute parce que j’ai dépassé la trentaine et en même temps suis revenue des questions liées au premier emploi/ premières ventes privées. Des vraies plumes dans l’équipe, des personnes à la culture générale riche et qui se posent des questions importantes (quid de la pollution? des inégalités? quel impact ce t-shirt à 150 dollars a-t-il sur le monde qui m’entoure?) seraient très bienvenues, mais ce n’est sans doute pas la ligne directrice du blog. une petite voyance pour Garance – rien de malveillant ou de dramatique, (ni wodoo, ni les cartes – juste un petit flash énergétique). Ça serait sympa si elle puisse le lire, juste pour voir après si ça se passe de cette façon. L’affaire et le blog vont aller toujours super bien aucun soucis, sans possible retour en arrière: le blog “tout Garance” est révolu, c’est le cours naturel des choses qui “marchent” et de la créativité. Le beau jeune homme se prénommant Chris est un petit “voyage nostalgique” vers l’époque où G. était entourée des musicos. C’est un petit oasis sympa pour apporter un peu de fraicheur dans le paysage “post-Scott”. Et dans 1 ou 2 mois on ne le verra plus. Il y a quelques semaines G. disait que NY était une ville où elle avait définitivement posé ses valises. Et pourtant, d’ici 1 an – 1 an et demi, G. va se tourner vers d’autres horizons: non, pas la Corse, ni même la France. En revanche – un pays chaud, oui, comme le sud de l’Espagne ou de l’Italie, ou même carrément un pays sud-américain (comme Costa-Rica…). Le climat trop “froid l ‘hiver-très-chaud l’été” de NY, plus les souvenirs, plus la possibilité de travailler de n’importe où – vont contribuer à ce départ. Et, comme le dit Garance elle-même: avec internet on se sent partout chez nous. En attendant, je continue à vous lire tous et à m’inspirer de votre travail. Je te suis depuis des années et ne me lasse pas de venir visiter ta constellation (il va falloir que j’aille voir ce qu’est Snapchat!). J’ai hâte de découvrir ton livre et les changements que tu nous réserves ici. Ton blog m’inspire et me fait rêver. Alors, je continuerai à te suivre avec tout autant de plaisir, j’en suis sure!!! Je suis ton blog depuis de nombreuses années, depuis le début presque, où tu habitais un petit appart sur Paris. C’est vrai, que j’aimais beaucoup la spontanéité et la fraicheur des débuts et même si ton blog a évolué, je continue à l’aimer car tu es toujours la même, il me semble. Dommage que tu n’ailles plus sur le web car j’aurais bien aimé que tu viennes faire un petit tour sur mon blog et que tu me dises sincèrement ce que tu en penses ! C’est toi qui m’a donné cette envie de mettre mon grain de sel là dedans et je voudrais humblement avoir ton avis ! J’adore Neada, de l’équipe c’est ma préférée :) A part Garance bien sur! Cela fait plusieurs années que je te lis quotidiennement (ou presque). Je suis ingénieure, je ne travaille ni dans le monde créatif, ni en rapport avec la mode mais ton blog me permet de garder le lien avec quelque chose que j’aime et qui me manque parfois. Tu dis vrai, cette page, c’est comme une maison dans laquelle je m’installe, je m’inspire, je respire ! Ce que j’aime ici, c’est qu’il ne s’agit pas d’un blog de mode mais comme tu l’as déjà évoqué, c’est un blog sur un style de vie et j’apprécie que l’on y parle de tout ce qui rend le quotidien un peu plus sympa, pas seulement de vêtements mais aussi de belles choses, de belles illustrations, de personnes inspirantes … Alors, oui, s’il te plaît, reste fidèle à ta vision d’un web qui se concentre sur la qualité. Le format du blog est très intéressant aujourd’hui car il te permet de faire les choses à ta manière et non à la manière de ceux qui ont designé l’application. Avoir un compte Instagram ou Facebook nous fait créer de l’Instragram ou du Facebook, ces médias sont tellement dévorants qu’ils ont fini par avoir leur personnalité propre !! que sur GaranceDoré.fr eh bien … c’est du pur Garance Doré & Co ! I also love fashion; beautiful clothes and the inspiration to various styles. But I cannot help but laugh heartedly when I see a pair of blue jeans for €550!! 550 Euro! They are in 100% cotton for €550….another really funny thing is that they are 100% cotton and still the recommendation is dry clean! :-D I don’t know about you…but have you really ever dry cleaned a pair of jeans in 100% cotton? And if you have then… Why? hello Garance, je suis ton blog depuis le début je crois et son contenu ne m’a jamais déçue, j’ai l’impression que tu es un peu ma grande soeur .. : )). J’adore voir avec tes yeux (si tu veux bien me passer cette expression un peu bizarre !!). Aujourd’hui quand je tombe sur une nouvelle marque, une tendance, un concept, ou un produit, je me demande ce que tu dirais là-dessus. Alors pas pourquoi te soumettre (ou vous soumettre) nos trouvailles et avoir votre feedback ? : )) Bisous !! Même si je lis les articles fait par ton team, j’avoue que ce sont tes articles qui me plaisent le plus. Alors contente de lire que tu vas à nouveau être plus présente. I love how you said you chose to cover less fashion week. You always stay ahead of the whole game and I totally you did the right thing about that. The whole fashion week drama looks very tiring and overwhelming to me to a certain extent that I no longer want to stay updated on what’s happening on the runway! So glad you think the same. Love love love what you are doing, hopefully you will arrange a book signing in Far East. I am a graphic designer based in Germany and I have been following your block for a long time now …during your time with/without scott… during visual and content changes… during your reinventions! I still come to see ‘you’ and your young teams’ contributions every day and although the blog has changed it still gives me a lot of inspirations, big smiles and amazements. If we don’t change our views from time to time stagnancy might come creeping in. I am glad you are back from your book-writing-break because I love your point of view on all the different subjects, but I also like to thank your team for jumping into your footprints – but also finding their own voice while doing so. Such a great job from all of you! Thanks from a distance! I have been following GD blog (which are also intials of my beloved boyfriend) since around 7 years already! I am relatively young proffesional (23 year old architect) and it is especially interesting for me how the blog has developed parerell to my growing, becoming a women, creative individual. I adore its beautiful visual and very personal content at the same time. Tho it is in a way extremely disconnected to my daily work and interests – I would never buy Vogue or any women magazine, intead I would totally go for Wired or The Economist, GD blog still remains in my every morning daily beauty visual routine, which in some way inspires me daily. Good luck and carry on ! I love the idea of a warm cozy home to visit as well as intimacy and authenticity. FWIW I prefer to interact with your site on my laptop but I’ve been hearing the beat of the mobile first drum for years so even I am using my phone for more (ha. becoming a mom does that to you- middle of the night feedings mean catching up on instagram and you only need one hand!). your blog has such a wonderful point of view- I look forward to the evolution. p.s. i buy your stationery for all my clients. yay! I agree with many readers. Your blog was unique because you were writing it and you had a very personable voice that clearly many of us could relate to. Your team is no doubt very lovely and fun but their taste, points of view or even fashion comments leave me cold. I don’t want to sound harsh but I increasingly find myself reading a post and losing interest within seconds. Of course you can’t be everywhere and have many other projects on the go and also need time to live your life but maybe your new direction towards ‘un blog plus intime et plus vrai’ might mean you going back to writing most of the content. If feel many of us don’t need to be bombarded with product placements and uninspiring posts. You could easily post yourself once a day or even every other day and you would still have the same amount of keen readers. Or it could be the case of having 2 separate blogs, one written by the Studio and one by you? I hope i don’t sound too critical but you did ask what we thought…. Hi Garance, I agree with a lot of others here: everyday I check your site, and it’s the only site I never want to skip. I especially like your personal touch, your down to earth way, and your style. I like to way you talk about all kind of topics, I understand that sometimes it is very intimate. What I don’t like is a show of all kind of clothes I will never be able to afford, there are already so many sites and blogs filled with that. But what I do like is to know what is trending, or what is always stylish. I also love your interior topics. Keep up the good work, I really appreciate it every day! Je crois que je suis une lectrice des touts débuts. Et que j’ai une certaine nostalgie du blog artisanal des débuts. Ton site est superbe et mérite son succès mais il est devenu un magazine en ligne avec tout ce que je reproche à la presse papier (notamment le flou entre les annonceurs et l’éditorial). Je continue de passer ici car j”y trouve ce qui m’intéresse : de belles images. J’aime beaucoup les “style de”, les visites déco, et toujours autant tes magnifiques dessins. Bonne continuation ! I have been following your blog for about 6 years now and carried me from high school to university to life as a young architect. I love it and have certainly noticed the evolution over the years. I can’t seem to make up my mind on what I think of the new format and posts though! I used to love the simplicity of your blog and would never miss a post but now I miss loads of stuff just because there are so many of titbits of them! However, I do think that the best thing is that you kept your style, aesthetics of your graphics (they have certainly evolved too!) and overall appearance, atmosphere and character of the blog. And, I really like your team! I don’t know how appropriate this is but you make me remember of Jamie Oliver and his empire! He expanded- a lot since his early years as the Naked Chef- but he still feels familiar and still has that genuine connection to people! So I would say, keep it up and all the best! It’s been lovely to see you (and the studio) evolve! J’aime beaucoup le coté magazine et informatif, lié a votre travail en équipe, pas mal de contenu, beaucoup d’inspiration. Mais c’est vrai que ce sont tes postes rédigés de maniere personnelle qui me touchent le plus! Meme si le blog est devenu tres haut de gamme dans le choix des produits, le coté simple et spontanée de tes posts n’a pas pris une ride, et au fil du temps, c’est l’un des rares que je lis, avec d’autres blogs plus axés sur le contenu et moins sur les looks, comme Tendance de Mode ou Café Mode par exemple! With your blogs, and with all blogs, I skip other contributors. It’s the blogger’s personality and story that keeps the reader interested, I believe. I understand wanting to diversify and make more magazine-like, but for some reason that just doesn’t work with blogs. For me, anyway. Because yours (and others) blogs are so high quality, I’ve lost patience with magazines now, even! Bonjour à toi Garance et à ton équipe. J’arrive un peu après la bataille mais j’avais, malgré tout, envie de te livrer mon ressenti. J’aime ton blog profondément, je le lis depuis le début, tu le sais, et ce qui m’avait profondément marqué à l’époque, c’est son élégance, sa grâce, son ton que je trouvais vraiment unique. Ouais on dirait que j’en fais un peu des caisses mais sincèrement, la légèreté et l’élégance qui se dégageaient de tout ça étaient très beaux. Je m’y retrouvais beaucoup et ton blog était une vraie inspiration. J’aimais tes illustrations déjà mais surtout tes textes et tes photos ont fini par m’achever, toutes les sapes que tu montrais me plaisaient, du sobre du sobre, du jeans, des t-shirts blancs et d’autres trucs qui se mariaient bien avec ces basiques là. Et puis les filles étaient parfois mal peignées, et ça, ça me plaisait encore plus. Les nouvelles versions du blog me touchent moins maintenant, sauf, comme certaines et certains l’ont dit avant, quand tu écris un post avec le coeur. Il m’arrive de me détacher de ce qui est présenté ici pour une raison assez simple, je ne me sens plus être le coeur de cible. Le mot fait certes ultra “codifié” économiquement mais c’est ce que je ressens parfois, je me sens à l’écart de tout ça. Je ne sais pas si c’est lié aux prix des choses ou c’est autre chose, peut-être que c’est moi, qui sait, mais ça peut parfois sembler être excluant. La forme est toujours très très belle sur votre site (photos superbes, contenus aérés, vignettes chouettes) ce qui quand même mérite d’être souligné tant c’est de qualité. Merci en tous cas de continuer à blogguer avec autant de sincérité et d’envie de faire participer ton lectorat d’une manière ou d’une autre dans l’évolution de ce blog. J’ai tellement hâte de lire ton livre. Je t’embrasse toi et ton équipe. Great letter, I can imagine taking some time away does a creative soul very well! So excited to see what comes next. Oh I love your blog Garance, and I ALWAYS get excited when I see a post that is written by you – I love the candour of your ‘speech’ and it always feels like it’s you and me and a big coze on a comfy couch… I think people above are missing that aspect, but you can’t have a bloody deep and meaningful conversation everyday! I love that you allow your team to spread their wings. Everything needs change and I think you’re doing a fabulous job with the blog! The only thing that would improve it, is if there were some way to put a little ‘translate’ button in the comments section! I feel like I am missing out on some good conversation because I can’t speak/read French and there is only so much copy and pasting into google translate that I can be bothered to do! Keep up the fabulous work Team GD – I look forwards to everyone’s contributions! Totally agree with you! This is a great suggestion – very practical and doable. Just scroll down the comments here; there are so many long ones in French that look so interesting. But as you said, there is only so much copying and pasting one can do. There is a comment below, made by Marine, in French. I plugged it into Google Translate; it is a very insightful comment and then right at the end, where she signed it with her name, Google translates it to Navy Seal. So ‘Bisous. Marine’ becomes ‘Kisses. Navy Seal’. This is why I love your blog and the intention you have behind it. Bravo! I wanted to let you know that I used to follow your blog when it was still in french – and I don’t even speak french!! The reason for my love was the fact that it was authentic, it was real, it was beyond words. Now it is just to “perfect”; it is the American influence, you talk about it a log but you don’t see how it effects the blog. It also seem that you narrowed down your target audience to very rich, thin women working in an office environment with their perfect nail polish. What about women over size 38, over 40 with a budget that won’t allow us to get the new Saint Lauren bag this season? This is your blog and your right to do a perfect ligh/makeup/hair studio photos only but it will probably cost you the followers who remember how your blog used to be i earlier days. Please know that your take on fashion is a refreshing change from the usual fashion blogs that sometimes rely on the vanity of the blogger. Thank you for creating a fashion community, on sharing relatable advice in a non-judgmental way. And most importantly thank you for inspiring me to find a creative outlet amid the constraints of a draining and uninspiring 9 to 5 job. I have been brave enough to start my new street style blog at http://www.thechicstreetpeople.com. I will continue to support you and please do check me out, as I begin my own creative journey. Welcome back Garance! :) Bon je répond un peu tard à ce post, mais je te donne quand même mon feedback sur le blog puisque je le suis depuis de nombreuses années (7 ans!) et que c’est aussi un peu une seconde maison où je passe presque tous les jours. Déjà félicitation pour neuf ans bientôt et j’ai hâte pour les 10 ans également (fiestaaa)! Les changements dont tu nous parles, ne me font pas peur car j’étais de ceux qui étaient enthousiastes à l’idée de voir arriver les contributeurs (et j’avais adoré lire Alex notamment). Cependant, il est vrai que parfois les articles des contributeurs manquent de personnalité ou d’intimité tandis que toi c’est ton truc. Quand on te lit, on a l’impression de lire le journal intime d’une bonne amie, de papoter avec toi, etc. Donc je dirais surtout surtout de ne pas arrêter de nous faire part de tes réflexions tout gardant ce fabuleux travail d’équipe (j’ai adoré lire Brie et Erik sur leurs impressions de One Fine Stay). Même si le livre va sûrement être personnel comme les histoires que tu as racontés tout au long du blog (je pense à tes premiers jobs, ton déménagement à NYC, les réflexions sur le poids, etc), garde aussi cette part dans le blog. J’aurais une petite critique par rapport au rythme de posts que je trouve parfois trop soutenu et je préfèrerais peut-être moins, mais des posts plus longs car tout est un peu trop organisé (je devrais pas dire ça car je sais que l’organisation c’est la clé) et ça fait un peu robotique parfois. Aussi, je ne comprend pas du tout l’utilité du shop mis à part pour tes fabuleux dessins, mais pour les autres choses tels que chaussures, etc, on voit que c’est plus de la pub rémunérée. Quant à la mode, c’est vrai que l’on pourrait te reprocher de l’avoir moins mis au centre du blog, mais ça ne me dérange pas car en effet on retrouve les même articles sur la fashion week de partout et ça ne m’intéresse plus vraiment. Je préfère largement une vision de la mode et de la beauté plus personnelle, les séries du blog qui m’ont le plus marqués sont les interviews carrières qui m’ont tellement aidés (tu n’imagines même pas) à trouver ma voie et à aussi savoir qui est qui dans le milieu. J’ai maintenant envie de devenir quelqu’un d’engagée et d’écrire des articles plus personnels (j’adore réaliser des interviews), j’admire vraiment beaucoup de femmes autour de moi et certaines que j’ai connues grâce à ton blog! Comme tu le disais, ici c’est une maison chaleureuse où l’on se sent inspiré. Et je crois que c’est vraiment ça la chose que tu dois conserver. Sinon, je vote pour le retour de PMF parce que c’était de la bombe!! Et par exemple, vous pourriez l’étendre à nous emmener dans des restaurants, des endroits que vous aimez à NYC et pas seulement des interviews mode (même si je les adore, je regarde souvent l’interview de Stella et Dries Van Noten). N’arrêter pas de tester, d’innover avec la technologie, les vidéos car c’est souvent quand vous avez testé des choses un peu “folles” que j’ai complètement adoré! Vous êtes vraiment une grande inspiration pour moi en terme de projets géniaux, de design et de sincérité! D’ailleurs, j’aimerais tellement être Intern au Garance Studio, mais vous ne prenez que des gens de NYC, non? Voilà, voilà c’était mon avis sur le blog et d’ailleurs merci de toujours nous laisser nous exprimer à son propos car cela ne doit pas être facile de recevoir des critiques. Puisqu’il s’agit de remise en question, je vais être abruptement honnête. Il est vrai que la version “style magazine” avec des collaborateurs ne m’a pas attirée et que dès que la présentation de ce blog à changé, j’ai eu un mouvement de recul comme de nombreuses autres lectrices. Le vrai fond de commerce de Garance c’est la bonne copine qui raconte ses choses sincèrement. Personnellement j’aurais tendance à faire ça sur mon blog mais comme les gens me laissent très peu de commentaires, j’ai l’impression de parler dans le vide donc cela me freine. Désolée pour vos collaborateurs (ne leur faites pas lire ceci) mais je viens sur le blog de Garance pour voir ce qu’elle a à raconter et leurs posts je ne les lis même pas. Je n’ai pas besoin d’un magazine en ligne il y en a déjà des tas et puis lire des articles c’est time consuming. Pour la mode, on n’a pas trop le même goût donc je cherche plus mon inspiration sur net à porter. Je n’aime pas non plus quand je remarque qu’une marque s’est infiltrée sournoisement dans le monde des blogueuses. J’ai surpris Cartier qui offre à certaines blogueuses (qui appartiennent à la même agence de mannequins) des bracelets (love) pour qu’ils apparaissent dans leurs photos. Cela me donne une impression d’être manipulée. Tout cela finalement nous ramène à un seul mot: sincérité mais je suis certaine Garance que vous n’avez pas encore oublié l’épisode de Charlie Hebdo et cela vous a fait sérieusement réfléchir: trop de proximité et d’exposition peut aussi avoir ses effets pervers et désagréables. De super copine vous pouvez passer en un jour de la fille à abattre.Ce n’est pas facile et ce monde change tellement vite qu’il faut tout le temps se réadapter. Suivez votre instinct c’est le seul conseil que l’on puisse vous donner. Hey dear Studio Doré ! why don’t you try to get someone with more “experience” ? I mean, why don’t you hire a 40 age person in the team ? Or even more a 60 years old one ? why not ? I guess it’s pretty hard for the team to talk about their owns life without maturing it before… I like what they do, but maybe an older person could bring the profoundness which is sometimes lacking in the team Doré articles. More PMF ! More CAREER interviews ! More LOVE ! Même si d’autres personnes écrivent où contribuent, le blog reste le tien, celui de Garance Doré, il respire ta patte . Franchement , je te lis depuis longtemps et je continue à cliquer sur ton icône dans mes favoris presque inconsciemment. Je ne suis jamais déçue, ni par les textes, ni les visuels, je continue d’apprécier ton art de vivre et chaque personne que tu mets dans la lumière… Parfois, allez je l’avoue, je projette de traiter un sujet et tu le fais donc je me dis “Oh Merde elle l’a fait :) ! et si bien fait !!!! vraiment Garance, tu fais un super travail et ton équipe est à ton image ! Un jour je t’interviewerais et je te ferais goûter mon houmous light ! Yalla bon retour et surtout reste cosmopolite, ouverte, curieuse et généreuse. tu mérites LARGEMENT ton succès ! I absolutely love your blog. I have been visiting the site almost daily for almost 6 years. It is always my favorite work distraction, visiting the blog and being inspired by the thoughtfully curated content, beautiful images and real talk. I love how the evolution of the blog has been very organic and transparent. Your readers are along for your journey as the blog has expanded and your influence and audience has grown. We are a part of your journey and I think your voice has always remained strong despite the addition of more contributors and new teammates. You keep doing you! I am headed to Costa Rica (!) for the first time in a few weeks and I could not be more excited. Any tips?!! Do what feels best for you (as you do already). Your blog is the best! I agree with Ebeth way at the top. I preferred when it was just you. All the other voices are just confusing, and often vapid. I don’t know who they are and I don’t really care. And the additional voices have not made the posts better. So many put together outfits (hats, pants, shoes, &c.) are perfectly banal. One would prefer the occasional personal weirdness to cookie cutter choices. Hi Garance and team. I don’t have the fortitude to read all of the comments, although I made a mighty effort, so forgive me if I’m repeating something that’s been said already. I’ve been a fan from the early (english translation) days and you continue to be a welcome reward during my creative and busy workdays. Here’s my feedback: My feeling is that since you expanded the team, the overall vibe of the site has gotten more youthful. Not a bad thing, but whenever you post a story about a true woman of style, someone who has seen a trend come and go and come again and has simple advice on how to live stylishly, I’m in love. I always always want more. Next time you’re hiring, my wish for you is to find a Costanza Pascolato (yes, she’s one in a million, and not exactly a ‘type’) to fill out the roster, even as an infrequent contributor. Comme cela a été dit plus haut, il faut DAVANTAGE DE GARANCE!! Je ne viens plus que rarement ici, parce que votre blog est devenu un site publicitaire, c’est dommage, et souvent écrit par d’autres personnes que je ne lis pas. Cela dit, je comprends qu’il vous faut aussi gagner de l’argent! Il y a aussi trop de choses, trop de vignettes, d’onglets, on ne voit plus rien; small is beautiful. Et puis, vous êtes sûrement partagée entre deux cultures, deux pays, deux types de partenaires, or le lectorat français et américain n’a pas les mêmes attentes. Revenir à l’essentiel, tout simplement, à vous, à votre personnalité! Merci!! et bravo pour avoir accompli la mission de rédaction du livre!!! I have also been following your blog since it was in French. I used to go on it every single morning, with a cup of tea, hoping there was a new post to read. It was like reading an email from a good friend. It was my little ritual. There were many things I could relate to, and it always made me smile. I still love your blog, but I am one of those readers who only comes here for your posts. I am sure your team is lovely, but for some reason, I just can’t relate to their posts. It’s not that familiar voice I was used to anymore. There are so many different little posts on the blog now from different members of the team, that I sometimes find it a bit overwhelming, but I just keep scrolling and looking for a little story from you, through all the other posts. On the other hand, I completely understand how busy you are, and writing a book and running a blog …and still having a life requires changes. I do hope however that we’ll be able to get more posts from you, or at least a more even ratio of Garance posts vs team posts. I cannot wait for your book!!! Je suis tellllllement FAN de ta plume ! C’est pour quand l’application Garance Dore ? Je vous avais envoyé un commentaire, mais il n’a pas été publié. Je ne disais rien de méchant pourtant, juste, comme beaucoup d’autres, qu’on aimerait lire davantage GARANCE!!! Il faut revenir à l’essentiel. Je trouve aussi qu’il y a trop de choses sur le site, trop d’onglets partout qui encombrent, on ne voit plus rien, et trop de gens qui écrivent. Et pensez aussi à votre lectorat français! !même si vous êtes partagée entre deux cultures. C’est sûrement très stimulant de travailler avec de jeunes gens, et ils vous apportent sûrement un tas de choses, mais ils n’ont pas la maturité qui est la vôtre et qui donnerait plus de consistance à leurs textes. Je vous souhaite beaucoup beaucoup de bonheur!! Je me permets de vous contacter car je cherche le modèle de vos Valentino Tango Pumps mais je ne trouve que celles en cuir lisse sur le site de Barney’s et sur le site valentino votre modèle n’apparait pas. Merci d’avance. Bonne continuation. Et ben tu vois, moi je comprends tout à fait ce que tu dis et j’entends bien ta façon de voir les choses et de faire avancer ton affaire mais me concernant, j’y vois un écueil. Ce que j’aime ici, c’est toi, c’est ta trace que j’aime et c’est pour ça que je te lis et que je te commente (tu es la seule dont je commente les posts et tu es du même coup la seule que je critiques; tu ne trouves peut-être pas ça sympa d’ailleurs mais je ne pense pas que tu tiennes un blog pour uniquement pour recevoir des caresses et des fleurs !!!). Aussi, ton équipe est formidable et se donne sûrement un mal de chien pour t’accompagner (elle le fait très bien du reste) mais je t’avoue que cette multiplication de posts “floute” ta vision, crée une abondance de contenu qu’on venait justement pas chercher ici et fait que ton blog ressemble maintenant à n’importe quel magasine, en ligne ou même pas en ligne, et plus du tout à ton blog. Je trouve ça dommage et je pense que c’était fatal et que c’est la rançon du succès, de la gloire, de l’argent et malheureusement du consensus dans lequel le blog tombe : parler de la mode, des marques et plus de la vision que tu en as. Je continue à te lire avec plaisir mais je suis un peu déçue. I love your work and your time are very good! I like the intimate perspective. So, I would like read more about fashion, not like put “this” with “that”, more about types of culture, the influence in lives and specially the women lives. Tks for all inspiration, happy and funny days with your messages. Je suis ton blog avec beaucoup de plaisir, j’y viens pour m’inspirer, oublier parfois les difficultés de mon quotidien ( puéricultrice aux urgences pédiatriques ), rêver! Et j’aime ta sincérité, ton honnêteté, ton authenticité! Le véritable luxe aujourd’hui est la simplicité! J’adore par exemple l’île de Ré, tout y est authentique et ça ramène au naturel! J’aime tes post, tes questionnement, par contre la superficialité m’insupporte! Alors poursuit ta voie vers la liberté! Et le moins! Car le véritable enjeux est de partir à la rencontre de soi-même! Your blog is like a warm welcoming house. There’s always something interesting here and it’s REAL, even though I live at the end of the world; )lol, I understand your ideas, your point of view and love the style you have.